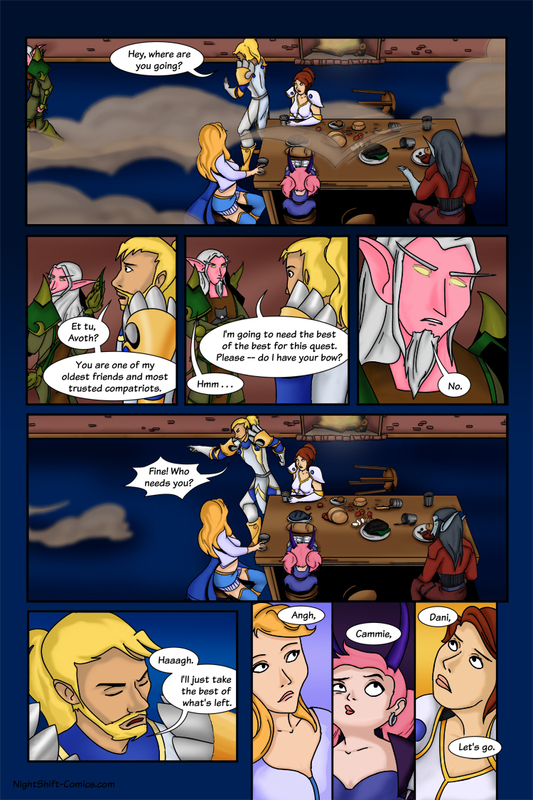 Third page of The Mountain of Almost Certain Doom. Now that the story is beginning to progress we'll be able to focus on just the key characters to the plot. Which is not only convenient for character development, but convenient for the artist, seeing as she'll only have to draw four to five characters max on each page for the most part. I tried doing something different with the coloring at the end of the page. I got sick of just using the same brick red background color. It would have begun to look boring had I colored the entire background like that. So for the last four panels I thought of bringing up the idea of each character having a signature color, Indevan is blue, Angharad is lilac, Cammie is dark purple, Dani is gold, and Vendelo will likely be a dark red. I figure giving each character a signature color might come in handy for when I'm doing word balloons that have ambiguous speakers, or in a shot that is so wide and drawn out, giving the balloons tails would take too much away for the art. Instead of the balloon being white, I could just make it the an appropriate shade of the character's color. Or something like that. That situation might never show up. Oh wait, I do know who knows. Me! It will come up. On the next page!